3rd Annual Chicago Spurs Holiday Toy Drive. Tottenham Hotspur Chicago is launching another community service effort! Our 3rd Annual Holiday Toy Drive begins on Sunday, November 29th! We are asking all Spurs fans and patrons of the co-sponsor of the event, the Atlantic Bar and Grill, to donate toys in the $5-15 dollar range in the spirit of the holiday season. All toys collected in the drive will be donated to children through Toys for Tots in honor of a friend and patron of the Atlantic Bar and Grill. 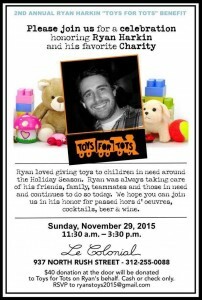 Your toy donation will brighten the holiday season for needy children. More information on honorary donations will follow. 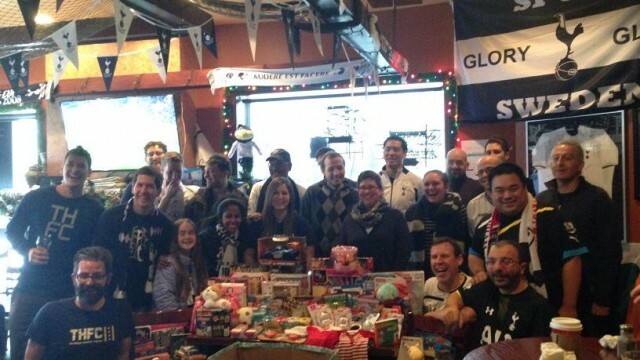 Spurs fans will have 2 Premier League matches to donate new, packaged and unopened toys! Bring your toys out on Sunday, November 29th vs. Chelsea and Saturday December 5th against West Brom. Thank you for your support during the holiday season.